Coloured aquatint by Thomas Daniell after the drawing by James Wales, of Pandoo's Cave (Panchalesvara or Bhamburda) in Maharashtra. This is Plate 2 of Antiquities of India, a set of eight views and one plan of rock-cut temples in Maharastra, published by Thomas Daniell in London in 1803. 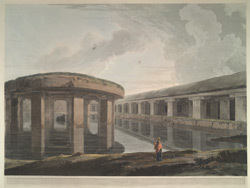 The rock-cut cave depicted in the aquatint is situated near Poona and is known as Bhamburda or Panchalesvara. The cave is still used for worship and consists of the central hall and the caves, seen in this view, which have been hewn out of the same great rock. In the backgound there is a image of the bull Nandi sacred to Shiva. James Wales's papers record that in September 1792 he sent his assistant Robert Mabon to make a drawing of 'Pandoo's Cave' and later probably visited it himself.